FOR INSTANCE IF THE MAILING address or CREDIT card ADDRESS WERE NOT THE SAME (THIS CAUSES A MISMATCH OR A UNCONFIRMED STATUS). The order will be subject to a full refund. If you can not get your credit card address confirmed, We can do a phone order using Visa, Mastercard or Discover. If using a bank account Via Paypal (not credit card or debit card) The order must be must shipped to where the bank statement is mailed. Even if you are shipping this to a work address. Prices: Prices subject to change without notice. No C.O.D. Orders accepted. Canadian Orders: Minimum order is $35.00. All orders from outside the U.S. MUST be payable in U.S. FUNDS, preferably in the form of a money order drawn on a U.S. bank or credit card. No foreign personal or savings checks accepted. A freight quote for each Canadian order will be sent to cover the shipping cost and insurance. 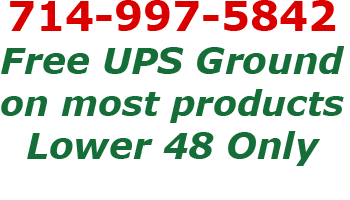 We use USPS that offers Express (5 day) and Priority mail service (6-10 day). The actual freight can be paid via paypal or with a visa or mastercard over the phone. Customer is responsible for GST or VAT. International Orders: Minimum order is $35.00. Currently, Four Season Distribution Inc does not ship internationally via our website (except Canada and the U.K. via Paypal), we can however accept bank wire or western union payments for international orders,Customer is responsible for any GST or VAT. Please email for payment details. Returns: All returned items must be postage prepaid, no C.O.D. shipments accepted. Any item returned for credit subject to a 20% percent restocking fee. All returned items MUST be in New and Unused. Refunds will be returned via the method of payment issued or at our discretion a refund check may be mailed. All claims must be made within 15 days from receipt of order. Our actual shipping cost will be deducted from your refund amount in addition to the 20% restocking fee. Defective items will be replaced.